This is a page where I plan to document the feedback I get from the book. Feel free to post your own comments below. Thank you. Below is an emailed review I received from a Muse relative, 18-year-old Erika Turner. Erika Turner, proud descendant of George and Willie Muse. So what happens when an idealist writer and charming person like Beth (let’s call her the “irresistible force”) meets a hardworking, nonsensical woman named Nancy Saunders (let’s call her the “immoveable object”) who is the pragmatic matriarch of her family? Nancy was determined that this story of human tragedy and suffering be told in the family’s VOICE and “restored the love, respect, and dignity that had been stolen from Uncles George and Willie as children? An idealist like Beth and a pragmatist like Nancy view time and space very differently. Beth wanted the world to know this unbelievable story of overt racism and economic exploitation. Conversely, Nancy Saunders has lived a lifetime of dealing with overt racism and economic exploitation – – she wanted someone she could trust to write the story accurately. Beth had to earn Nancy’s trust over two decades before she could write an authentic story about the lives of the men known as Eko and Iko. This is why it took 25 years for the book to be written. I would often get frustrated telephone calls or emails from Beth when Nancy would not respond to her inquires or visits. I would just laugh and tell her that if she is still talking to you, you will get the story. The Saunders/Turner family pride themselves on “keeping it real” and if they like you, you know it. Likewise, if they don’t, you know it as well. There is no ambiguity when it comes to this family. Nancy wanted this story told accurately because she wanted to bring human dignity to her uncles, men who had been described by various circus entities as “Ecuadorian Savages,” “Emigrants from Madagascar,” and “Darwin’s Missing Links.” Later, they were known as “Eko and Iko, Ambassadors from Mars.” The circuses had totally dehumanized these men. — Dr. Reginald Shareef, Oct. 16, 2016. Another writer would have written a teleplay about the Muse brothers’ journey from (literally) dirt-poor beginnings, through involuntary, indentured servitude, and on to their interesting lives as freaks in a myriad of 20th century circuses. But Beth Macy is a journalist, and “Truevine” is a story that took decades to get to the bottom of. Further, she cares deeply about the people and places in this book. Who should read this book? Every Southerner, descendant of the South, descendants of carpetbaggers, and transplants to the South. The daily venom and institutionalized insults that African-Americans suffered — and they did suffer — cannot be guessed. It must be told, and it must be read. So much more insidious than separate water fountains, Macy conveys the scope of the pervasive, poisonous hate and innate/outright meanness that was the Jim Crow era. Anyone who is unable to utter the three words “black lives matter” without qualifying it in some way needs to read about how little they did matter to anyone. As interviewee A.J. Reeves asks Macy in this section, “Are you SURE you want the truth?” More than anything we all need this truth, and Macy delivers, unflinchingly. “Truevine” explores the world the Muse brothers were thrust into; a world of sideshows, fellow freaks, and people who could be “bought” by “talent scouts” and traded like Pokémon cards among “managers”. Step right up, folks, and get your look at the machinations and subterfuge used in packaging oddities of our species. Partially chronicled through photographs, Macy’s research magnifies the clothes, expressions, and body language to get a feel for the path the brothers weaved in and through the insulated circus community. As a former reporter, Macy is equally adept at poking family sore spots and dodging verbal slings and arrows as she learns more of the story, questions a tightly-knit family’s lore, and presents evidence suggesting other probabilities. A fiercely tenacious writer, Macy is an equally ferocious mother, and she chronicles the plight of Harriet Muse, the mother who waited (and hustled while waiting) and through sheer force of will snatched her children back from the circus. The legal chess game that ensued was played across decades. Wherever Harriet Muse got those smarts from, the gift was not wasted. Those who enjoy legal yarns and unlikely heroes tilting poles at windmills will not be disappointed. In a book rich with injustices, a victorious underdog prevails. I found much food for thought when the sideshow traveled to entertain overseas. Due to the war wounded in England, and daily being confronted with the ravages of war on deformed, injured soldiers made looking at sideshow freaks for entertainment feel inappropriate. It’s a sobering contrast to the antics Macy chronicles in the peculiarities of the performers themselves. “Truevine” eventually ends at a resting place after its exploration of a century of change in these interesting and unusual chapters. That resting place is the loving, protective and attentive care of the family in Roanoke, Virginia. Macy’s town. My town. A place where the darkest chapters of history were perpetrated by the real freaks — the local Ku Klux Klan, and the institution and legislation of racism are our very shocking past. Several times, the brothers’ caretaker relative reminds us that the brothers came out on top in the end. However this war ended for them, the casualties of that very uncivil war are still among us. This book will have your mind “Musing” on all these aspects and more as you continue to digest its story and scope long after the pleasure of the read is completed. Great job Reggie, your intro was very respectful to all. I look forward to reading the book. Im ordering it today. Beth, I am about to finish your new book. It is most interesting. I was especially interested to learn why Lee Scott (Warren Messick’s client) got out of prison so quickly after killing Dana Weaver at Christ Episcopal. I was only a pre-schooler at the time, but his picture was next to my cousin’s in the Jefferson yearbook and I heard a lot about it as a child. One additional thing. I don’t believe the Mercer Avenue house is considered to be in Rugby. Rugby was much more to the east around Eureka Park all the way to 10th Street. My favorite aunt, uncle and cousin (mentioned above) lived in a house across the street from the Muse/Saunders house back in the 40’s. I don’t think that neighborhood really had a name. I think 2 of my classmates actually lived in the Muse/Saunders house prior to 1960 . See you at the St. John’s event! My name is Diane Hayes I met Beth many years ago while she was researching the Muse brothers family. She is one of the nicest people I have ever met. I worked at the Franklin County Public Library for 33 Years. Over the years I worked very hard building a collection of black family histories. I am very much impressed with the detail Ms. Macy went into with this book. I am thankful to her for remembering the work ” Oh Master” compiled by Audrey Dudley and I. Audrey Dudley donated her collection of obits from black funeral homes in Franklin Co. and surrounding areas to the Gertrude Mann Room located at Franklin Co. Library. I have also compiled over 50 books many concerning black families in Franklin Co. I hope that other people see the need to tell their stories the good and the bad. I feel if we don’t tell our young people our history they will not know the hardships and also the wonderful thing we have endured. They will fail to know that where we come from. I hope that one day this book will become a text book in our school system. I met Mr. Rabbit Muse when I was a student at Ferrum College ( 1974 to 1978 ) in a Virginia Folk Life Class. He was something else. I love his music and dancing. I also know several of his family members. Wow Beth I wish you would write a book about Mr. A. J. Reeves he is a wonderful man. Good book. Thanks. Are there any musical recordings of the brothers? I know you mentioned a home recording of Willie in his later years. Obviously, their story and your book explode on many levels. For me, the through-line: After the first handful of years, George and Willie became traveling musicians. Their talent for picking up melodies on-the-spot along with eclectic influences on the road (Tipperary, no less!) probably made for some fascinating music. I know there’s talk of a movie. I’d hope someone would pay some American musicologists to do research. It fits right into the Americana/Roots resurgence – and would add an important dimension to the production. Your presentation at Jerusalem Baptist Church on Dec. 3 was awesome. It’s not often that one gets a chance to see and hear an author interact with some of the subjects in her book, much less makes the audience feel important. I hope you never lose your knack of getting your readers involved. JoAnne, the treat was entirely mine! It’s not often an author gets to interact with so many people in her book at once. Truly, thanks for making such great memories for me. I so appreciate you and Jerusalem Baptist Church! I just finished reading Truevine and thoroughly enjoyed it. Although difficult to imagine a life where people were treated as commodities, that is a sad and very long chapter in our American history. Thank you for presenting the”other side” of this issue in your story. One question that I did not see addressed in the book is what happened to Cabell’s automobile following his death and why wasn’t the car and/or the money from sale of the car passed to Harriett?? Ms. Macy, I am curious about the Saunders connection in Rocky Mount. I have Saunders family with roots there and have written a book about that family. Do you happen to know if the Saunders in Truevine are related to Sandy Saunders of Rocky Mount, (b. 1827) ? He was from the plantation of Samuel D. Saunders. I appreciate any feedback you provide. I look forward to reading your book. For over 40 years, our family has been driving between Martinsville and our Smith Mountain Lake house up the Snow Creek Road and turning on the Truevine Road, passing the graveyard of Truevine Missionary Baptist Church. When I first heard about this book at a book-signing and talk Beth Macy gave in Martinsville on Factory Man, I knew I had to read it. I just finished reading it out loud to my husband as he drove, some of the trips through Truevine itself. We were not disappointed. At times, the book seems to digress down a myriad of rabbit trails, but it always comes back to George and Willie and Harriett–and Nancy Saunders, who is just as prominent a character as the others. I was especially moved by the account of Willie’s last years under Nancy’s care and his burial service. As privileged white Southerners (I was transplanted at age 5; my husband’s grandmother was a niece of Roxanne and Pocahontas Hundley Bassett–see Factory Man), we were given an eye-opening view of the reality of life for our black neighbors. It makes us uncomfortable, me especially, since my parents tried to raise us to be free of prejudice and to respect everyone regardless of race. But it is vitally necessary for whites to understand the harsh day-to-day injustice and indignity suffered by our fellow human beings. I cannot understand or fathom the hatred many whites had, and some still have, for members of other races, blacks in particular, although many of them have transferred that hatred to “Mexicans.” I do feel bad that I absorbed prejudice from peers at school, when I’ve tried so hard not to. 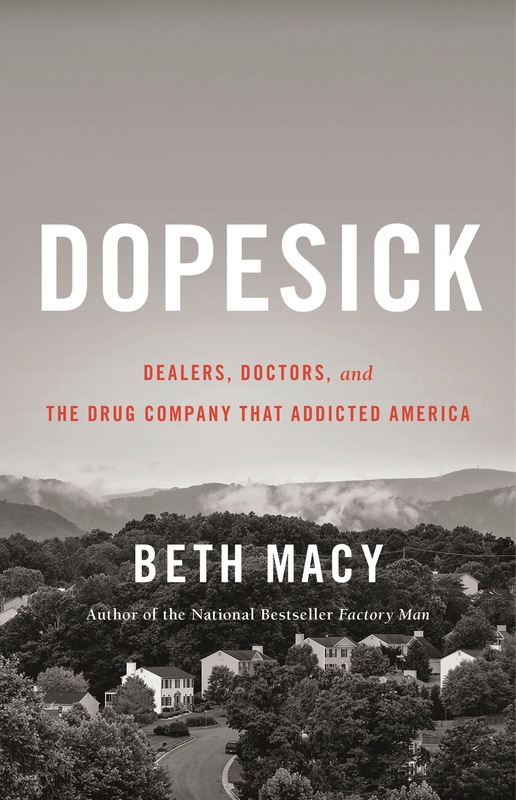 Thank you, Beth Macy, for writing this book. I can’t wait to hear about your next project. I will use Truevine for my program for my book club on Feb. 10. I hope I can get a chance to hear you speak between now and then. I was born in Roanoke in 1943, but moved when about 2. My father was born in Rocky Mount where his father was a druggist (we used to be able to say that word.) the family moved to Roanoke when he was young.. My father remembered George Washington Carver lecturing at Jefferson HS probably about 1930 or 32 and was in the Eagle Scout honor guard when Pres. Roosevelt spoke at Roanoke college in 1935. After seminary in Rochester, NY, he returned to pastor 4 rural Baptist churches along hwy 11, Enon, Troutville, and two other smaller ones in the neighborhood. I remember hearing about the “progress” when the neighborhoods were torn down for the beltway about 1960 or so. How I wish I could ask my dad about this whole era – like, did he go to the circus at age 12 in 1927? He carried the Roanoke Times from about age 14 – what was in the paper? Thank you for FACTORY MAN and for TRUEVINE. Particularly because I know (some) and recognize the landmarks in the area, I have appreciated the books very much. They are not necessarily comforting, but very helpful. Enjoyed Truevine – reminded me of seeing similar sideshows as a child in the fifties. Was recently in a Pennsylvania antiques store and was surprised to see a small wooden colorful lighted sideshow stand with the Men from Mars. The owner had no idea who those men really were so I gave him a brief rundown. Unfortunately the item was a bit out of my price range – there was a matching stand with the Bird Girl. I’d be happy to send a photo if you’d like. Why I love Truevine …. It took me into worlds that I knew little or nothing about: What it was like to be poor and black in Roanoke, Va., in the early 1900s; What it was like to live and work with a traveling circus and sideshow in the mid 1900s; What it was like to be objectified and commodified through no fault of your own. The big ideas in Truevine are so relevant today. Whose history are we learning? Whose voices have been forgotten? The truth is always more complicated than it seems. What will happen if no one does the hard work to seek out the hard-to-uncover truths? It’s Lin Manuel’s Hamilton and Black Lives Matter. Beth, your persistent reporting is laudable, for sure. But so is your willingness to say: I don’t know and Who am I to draw conclusions? I love that Truevine is the story of your search for truth, Beth, intertwined with the Muse brothers’ search for better lives and their mother’s search for her lost sons. As a reader, I found myself searching my soul for a way forward that is more just and inclusive than the time and place when George and Willie Muse made their marks. Please excuse the informal introduction, but after listening to both of your books, one feels as though you are a personal friend. I first learned of Truevine from a mention in a free copy of White Tops sent to me from the CFA hoping that I would reup my membership. I have been a true fan of the Ringling Circus since I first saw the 1952 Cecil B. DeMille movie as a teen in the mid 60’s. It hurts me very deeply that this 146 year old institution closed on May 21st. I grew up in Winston-Salem and the way that you describe Roanoke during Jim Crow brings back many memories of listening to my grandmother describe “East Winston” when I was less than 10 years old. “East Winston” and “West Roanoke” are, I suspect, just like all southern cities of that era. Factory Man is also a great book that makes me want to visit Bassett just to look around. I was headed west on US 58 and made a wrong turn a few years back when I headed north on US 220 and ended up in the town with all of the shuttered factories. I can certainly identify with John Basset’s inhouse clinic since my mom was a longtime employee of RJ Reynolds, a company with its own inhouse health care. Please rest assured that no company doctor from RJR ever told a patient not to smoke. I could write more, but I hope to shake your hand soon and put a name with a face. I have your new book about opioid addiction already on my radar. Thank you, Beth, for such enjoyable, entertaining and informative books. As I read Truevine, I cried more times than I can count. You opened my mind to a world I’ve thought about ever since my dad refused to let me visit the sideshows at 1950s circuses. Thanks for all your research and the warmth you showed. You go girl! Thanks so much, this is such a dear note! I am, white but very much appreciate your effort to bring the essence of Jim Crow culture out in your book. It makes my skin crawl in the way our current culture ignores the feelings of others today. This is life as we know it. Just the description of the book cover and the observation that the tobacco crop lacks proper fertilization, brings out the sense of feeling of another point of view. I can’t thank you enough and will buy your earlier book. Dear Mr. White, what a very kind letter! The reaction to this book has been so unpredictable, from community forums in which whites and blacks alike still struggle to find the words to describe what happened, to a recent book-tour event in which a white farmer came up to tell me how he had assaulted the young child of a black sharecropper on his family’s farm. “I have no idea why I did it. I beat him with a bundle of onions. Blood and juice flying everywhere.” The farmer needed to confess. He was 5 when he did it. He was probably 75 now. I think we need to tell these stories. Thank you for understanding that, and for writing to me. All best, and I hope you enjoy “Factory Man.” I still feel lucky to have found that story for my first book, midway through my journalism career. Just finished reading Truevine and was delighted to find this recording of Willie singing It’s a Long Way to Tipperary online. Thank you for such an enlightening book and for posting Willie’s song.